Masks have always intrigued me. They can be great fun and create a sense of mystery at costume parties. Arguably, people wear masks of some sort a lot more often than an occasional party, more likely, on daily basis. Makeup would be the best example here and one of common physical masks. The other type of a mask is the one that is more difficult to notice and identify. Wearing this kind of a mask can be compared to taking on a different personality to show to the people outside of some predefined comfort zone of the wearer. Conforming to surrounding society or community norms, however, is usually a necessary skill to practice. Similar to the necessity of applying stereotypes, wearing masks makes life easier. With stereotypes, people are able to quickly organize the constantly incoming information flow. 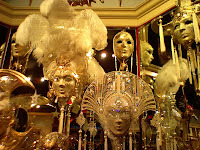 With masks, people can go about their daily life without having to explain their uniqueness if they do not want to, without frequent misunderstandings but protecting their innermost personality traits from possible attacks. Too often though, the barriers are thick and getting to know someone well becomes a uncommon privilege.